Our dude Iyaz is on the scene again with his new hit Solo. The song is fresh as an island breeze and yes, he is ZShock'n again in this video. This time Iyaz is rocking his G-Shock iced out by ZShock with all canary diamonds. 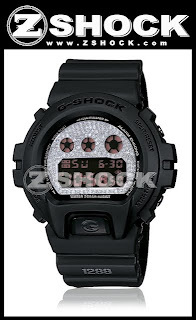 The watch he has is the ZShock Ultra with all the parts of the watch flooded in diamonds. See the ZShock Ultra Collection here, and you too will see why the ones with SWAG all rock a ZShock in their watch collection. The ZShock Sleet series displays a different way that a G-Shock can get iced. The Sleet maintains the original design elements of the traditional G-Shock with a unique element of an iced out dial that adds a bit of intrigue and uniqueness to the class style. Here we display the Military series 6900 but many of the 6900's can be Sleeted out. Another I.C.E.D. by ZShock creation! Click here to shop the Sleet Collection by ZShock! Chris Brown was in town for the 2010 B.E.T. 's Spring Bling celebration. The venue was West Palm Beach Florida and it was jammin, to say the least. Chris Brown was seen sporting a Red Diamond ZShock Ultra during his performance. Needless to say Chris Brown is a ZShocker and owns quite a few pieces from ZShock. Yet again another display of a man well versed in Swag chooses to rock a ZShock.